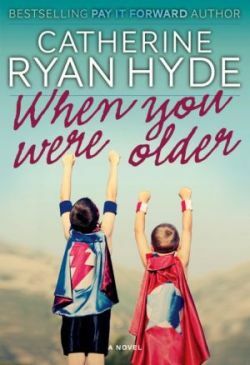 Starting today, my novel When You Were Older is free for Kindle for three days. So today, tomorrow, and Friday. Just click on THIS LINK and grab one. Free. That's it. No catch. Except that it's a fairly brief window. But it doesn't take long to click on a link, so it should be more than enough time for you to get your copy. Well...one other catch. U.S. only this time. Sorry, UK readers. It's not that I don't love you, too. It's that this book is traditionally published in the U.K, so I have no legal right to give books away in that territory. One of the upcoming promotions will be for you, too. Promise. Now. I say this a lot, but there's always someone who doesn't know it: You don't need a Kindle to download and read this book. Just click on the link I provided, and on the right-hand side of the detail page, look for a box that says, "Read books on your computer or other mobile devices with our FREE Kindle Reading Apps." You can download an app for your computer, tablet, or smartphone. And the total price tag is still zero. Also, if you have a Nook, or other non-Kindle ereader, CLICK HERE for conversion instructions. Why do I give away so many ebooks? I get that question a lot. To say thank you to my current readers, and to encourage lots of new readers to give my books a try. You get free books, I get more readers. Everybody wins. If you want to know more about the book, you can go to my When You Were Older book page on this site. Or click through to its Amazon page and read the reviews. As of this writing, 83 reviews averaging 4.7 out of 5 stars. Or better yet, grab a copy and start reading it. That will tell you all you need to know, and you have absolutely nothing to lose.